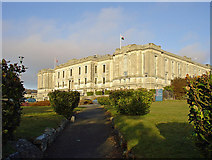 Academic staff, research staff and students of the University of Southampton are entitled to reference access and in some cases borrowing rights at other research libraries in the UK and Ireland. The Sconul Access scheme covers 179 institutions within UK and Ireland but doesn't cover the major copyright libraries (British Library, the national libraries of Scotland and Wales, the University Library Cambridge, Bodleian Oxford and Trinity College Library Dublin) for which individual details are given on this page. Contact libenqs@soton.ac.uk for further help. This scheme grants borrowing rights to staff and research students to 179 institutions in UK and Ireland. Full details of the scheme are available on the Sconul Access website. To apply for a Sconul Access card fill in the online application form on the Sconul Access website. You need to complete Steps 1 and 2 on the initial page (whether you are postgraduate,staff etc, and your home institution), then select the library you wish to visit, then you are presented with the online form. You request will be processed and you will receive an confirmation email. When visiting other libraries in the scheme take both your confirmation email and your University of Southampton library card. Sconul Access does not necessarily allow access to an institutions e-collections however some institutions do allow walk-in access. Please check directly with the institution if you think you need to access an item from the e-collections. If you don't know which library might hold information you need, you can try searching COPAC, a catalogue covering the over 70 major research universities and national libraries in UK and Ireland. Full details of opening hours and how to register for a reader's ticket are available on the British Library's website. In brief you will need to take both your university library card and two proofs of identity. You should also have details of which items you need to consult (you can check this on the British Library's catalogues). Certain collections, namely the Sound Archive, Print Room (Asia, Pacific and Africa Collections) and Philatelic Collections, require prior approval and you should contact the appropriate department in advance. A general reader's ticket lasts for three years. There is an online application form and this must be filled in and brought to the library along with at least one form of ID showing your name and address supported by a signature or photograph. It is also possible to register for remote access to the library's digital collections. 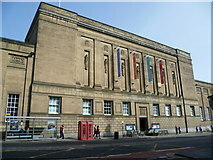 Opening hours, the library's catalogue and more detailed information about the library's collections are available on the National Library of Scotland website. © Copyright kim traynor and licensed for reuse under this Creative Commons Licence. Reader's tickets are issued for three years and are renewable. An online application form must be completed before visiting the library. On your first visit you must bring two proofs of identity, one of which shows your current address. No ticket can be issued without adequate proof of identity being given. The National Library of Wales website links through to its catalogue, opening hours and collections information. © Copyright Dylan Moore and licensed for reuse under this Creative Commons Licence. The card can be collected immediately. The Bodleian Library is a reference-only library. The Bodleian's website gives full information on opening hours and collections and access to their catalogues. To apply for a reader's ticket, staff and research students should take application Form A, University of Southampton library card and their Sconul Access card (or Sconul confirmation email) to the Bodleian's Admissions Office. Staff and research students who wish to use the Bodleian's Special Collections, should also fill in application Form B. Staff and research students can apply for reference-only reader's tickets at the University Library, Cambridge. You must apply online no earlier than 6 weeks before your planned visit. Staff and research students will also need to present their University library card and a proof of address (no older than 6 months) at the Admissions Office on their first visit to obtain a card. You are strongly encouraged to make an admissions appointment to avoid unnecessary delays, please telephone: (01223) 333030 to schedule an appointment during the Admissions Office opening hours. Staff or research students wishing to use the manuscripts collection will also need a letter of introduction from their Head of School or supervisor.